Rail Cat! 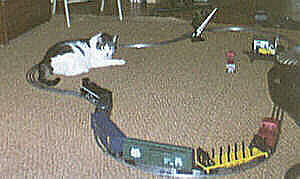 O gauge train running, with cats! Is this any way to run a railroad? The problem for train-runners who pursue the hobby at home is the likelihood of interference. Our cats are attracted to anything unusual, and they enjoy watching us run our trains. Here are a few quick photos ther first train-running episode. "You stop right there or else!" "Oh boy! This is fun! Whoooo! Whoooo!" 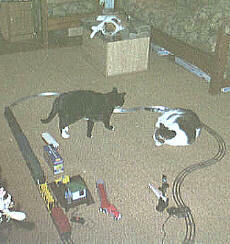 Our cats working like Erie RR men - Zzzzzzz! "This is what fun is!" 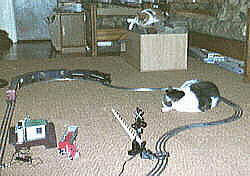 Lionel 4-4-2 Atlantic locomotive, Corgi "Lionel City" bus, Hershey's Diner and Chessie "sleeping cat" boxcar.